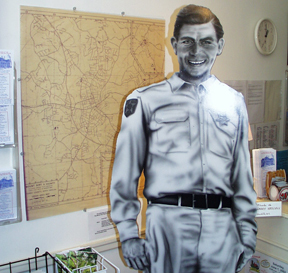 Andy Griffith Museum – it's a little piece of Mayberry in NC | Best Road Trip Ever! Howdy! Few can forget the beloved Sheriff of Mayberry. That’s especially true for the citizens of Mt. Airy, the boyhood hometown of Andy Griffith, whose streets and hometown characters bear a striking resemblance to the fictional Mayberry. This is home to the new Andy Griffith Museum, with the largest collection of Andy Griffith memorabilia collected by his friend Emmett Forrest. Memorabilia includes several of his old comedy records, Mayberry mementos, and even his Matlock suit! Be sure to grab a bite at the Snappy Lunch. You won’t find Aunt Bee, but you will love the fried pork chop sandwich! After a rather PROLONGED absence from his old stomping grounds (45 years!) Andy did return later in 2002 when a stretch of highway outside town was named in his honor.